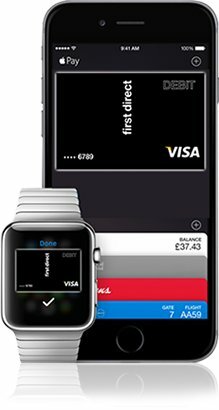 U.K. bank HSBC and its First Direct brand enabled support for Apple Pay on Tuesday, delivering on an earlier promise and filling in an important coverage gap in the region. HSBC was initially announced as a launch partner for Apple Pay's mid-July U.K. debut, but ended up missing while other banks went live. In response, the company said that it was "working closely with Apple," and "properly reviewing and testing our systems before launching in two weeks." First Direct is an Internet- and phone-based HSBC brand, with no actual branches, though customers can make payments and withdrawals at HSBC locations, and in some cases Post Office branches. Several other banks went live with Apple Pay mid-month, among them Nationwide, NatWest, the Royal Bank of Scotland, Santander, and Ulster Bank. Even with HSBC and First Direct on board, though, some notable gaps remain, namely Halifax, Barclays, Lloyds Bank, and the Bank of Scotland. Those institutions should be ready by the fall. Apple Pay can be used at over 250,000 retail locations in the U.K., including Boots, Waitrose, and Transport for London. It can also be used for online-only transactions in some apps. Retail purchases are limited to the iPhone 6, 6 Plus, and Apple Watch, but online transactions also support the iPad Air 2 and iPad mini 3. No announcements have been made regarding future countries for Apple Pay. The next target though is rumored to be Canada, which could be getting the service in November. It originally debuted in the U.S. last October.